Lipoma, also known as universal tumor or ubiquitous tumor, can occur anywhere in the body, its incidence being 0.1-5% of all head and neck neoplasms. They are benign neoplasms composed of mature adipocytes. There are various types of lipoma based on the constituent tissue type and location of the lipoma. Though lipomas are slow growing and seldom invade adjacent tissue, some variants do exhibit infiltrative behavior. 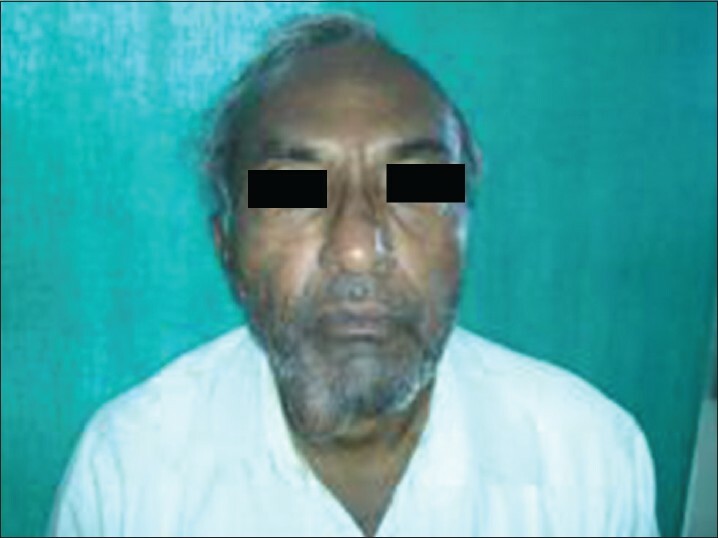 Here, a case of infiltrating type of lipoma of the chin region is presented, which had suddenly increased size in the last 1 year, which led the patient to seek surgical treatment. 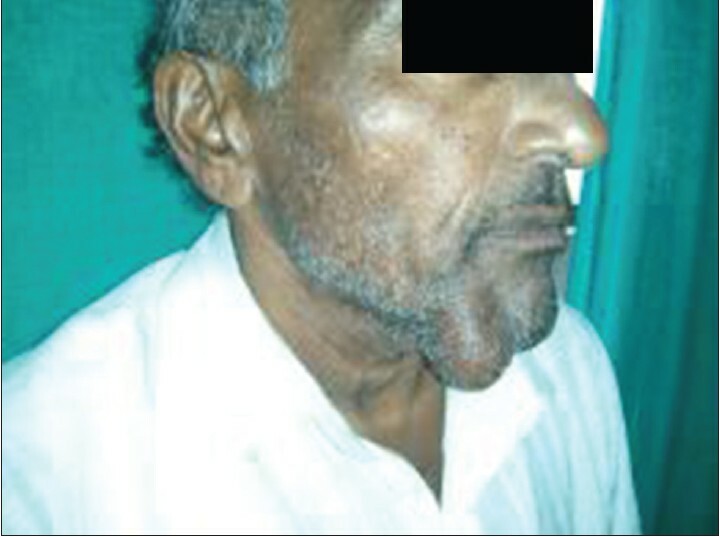 A 70-year-old male reported to the Department of Oral and Maxillofacial Surgery, Dr. D. Y. Patil Dental College and Hospital, Pimpri, Pune, with the complaint of a painless swelling on the right side of the chin since past 15 years, which had further grown rapidly in the last 1 year. Patient had no associated symptoms of weight loss, fever, paresthesia, or pain. There was no history of trauma to that region. Extraoral examination revealed an oval shaped mass on the right lateral chin region roughly measuring 5 cm × 3 cm in its greatest dimension. It was of normal skin color, with normal skin appendages. There were no secondary changes seen [Figure 1], [Figure 2], [Figure 3]. On palpation, it was soft, skin over the swelling was pinchable and slipping sign was positive. However, when the patient was asked to contract his mentalis and platysma muscles, there was slight restriction of mobility of the swelling. No abnormalities were seen on intraoral examination. Ultrasonography revealed ill-defined regions of altered echogenicity similar to subcutaneous fat. Underlying mandibular cortex was intact. Features were suggestive of lipoma/fibrolipoma, and fine-needle aspiration cytology (FNAC) correlation was suggested. However, FNAC was not done as the patient didn't consent for the same. 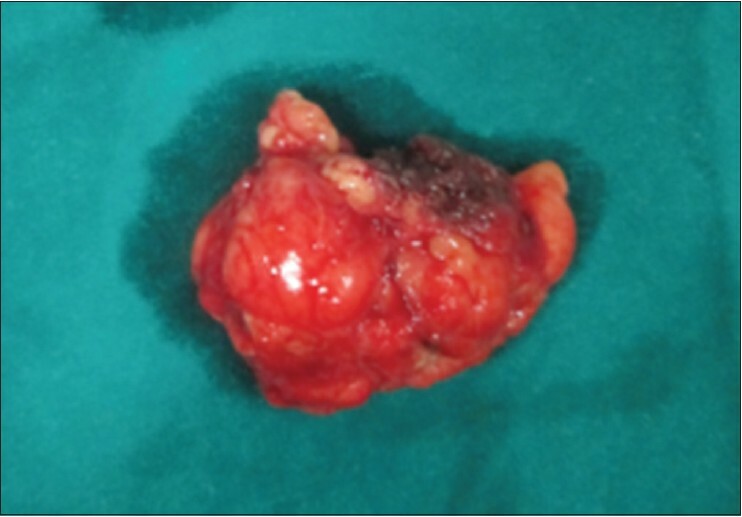 A provisional diagnosis of lipoma was made and excision of the lesion was planned under local anesthesia. 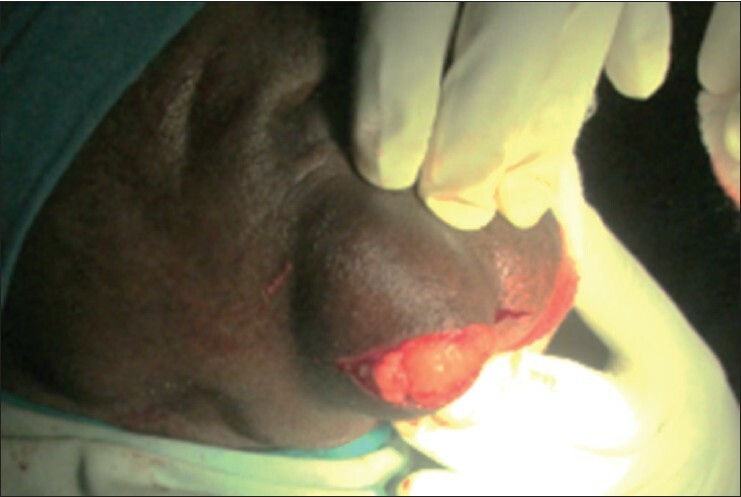 The lesion was excised through submandibular approach under local anesthesia with intravenous sedation. 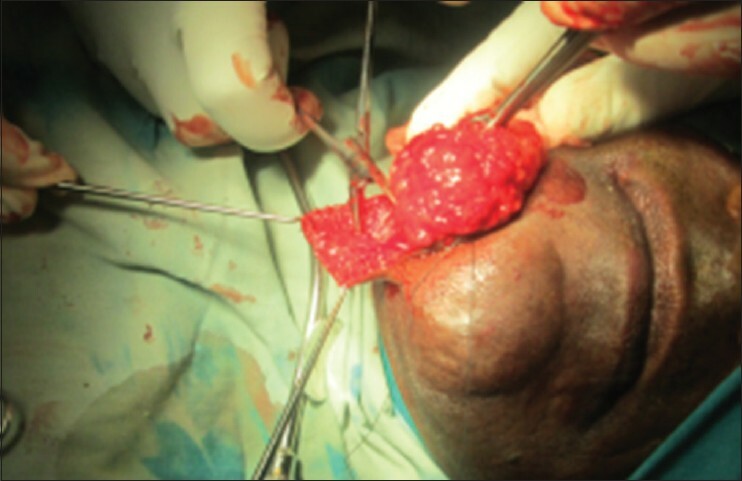 A horizontal incision was placed along the inferior aspect of the swelling, and the mass of adipose tissue was identified and exposed by blunt dissection [Figure 4]. It was noted that the mass was poorly capsulated and there was considerable attachment of the lesion to the underlying muscle fibers. It was excised along with the attached muscle fibers [Figure 5] and [Figure 6]. The excised specimen measured roughly 6 cm × 5 cm in its greatest dimension [Figure 7]. 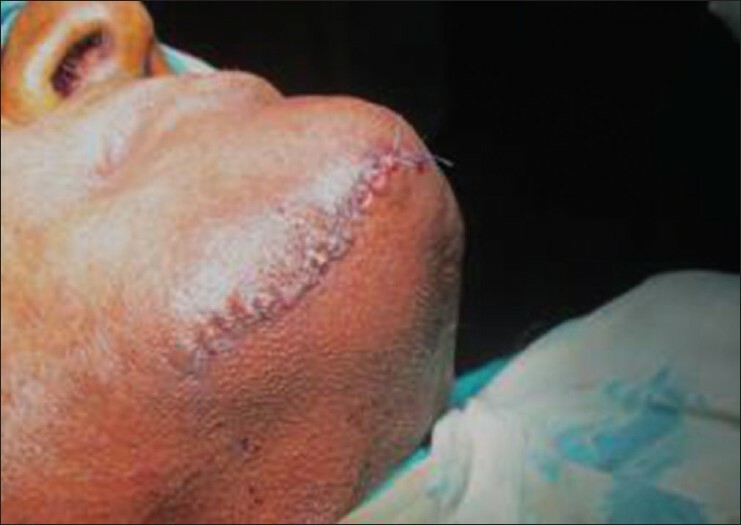 The excess skin was trimmed, and wound closure was done with polypropylene sutures [Figure 8]. On follow-up, healing was satisfactory with an esthetically acceptable scar [Figure 9]. Histopathological examination revealed lobules of mature adipocytes separated by connective tissue septa, giving the diagnosis of lipoma. Considering the attachment of the lesion to the muscle fibers and poor encapsulation, another histopathological examination was requested of the deeper portion of the lesion. This section showed the presence of strands of nonatrophied muscle tissue interdigitating between the adipose tissue [Figure 10]. No cellular atypia was seen. 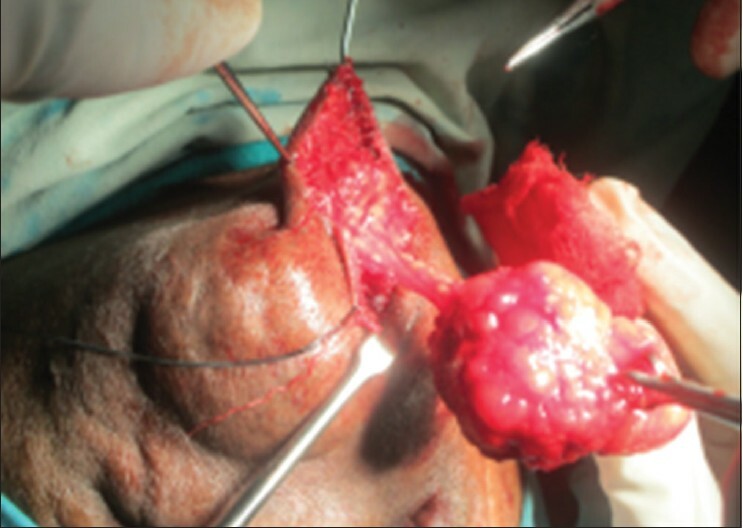 Based on these features, this lesion was classified as an infiltrating type of lipoma. 1. Cicconetti A, Guttadauro A, Mascioli PA. Rapidly growing infiltrating lipoma of the oral cavity and the mental region. Oral Surg 2010;3:140-2. 2. 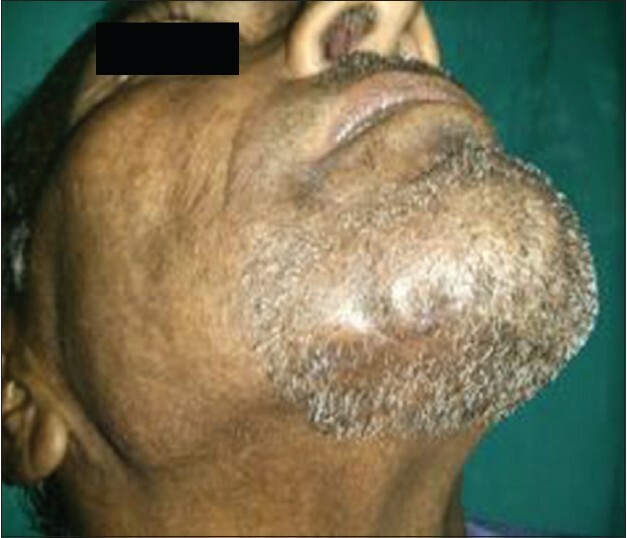 Singh G, Sharma V, Dhameja M, Singh B. Subcutaneous lipoma of the face: A case report. J Oral Health Res 2011;2:78-80. 3. de Visscher JG. Lipomas and fibrolipomas of the oral cavity. J Maxillofac Surg 1982;10:177-81. 4. Salvatore C, Antonio B, Del Vecchio W, Lanza A, Tartaro G, Giuseppe C. Giant infiltrating lipoma of the face: CT and MR imaging findings. AJNR Am J Neuroradiol 2003;24:283-6. 5. 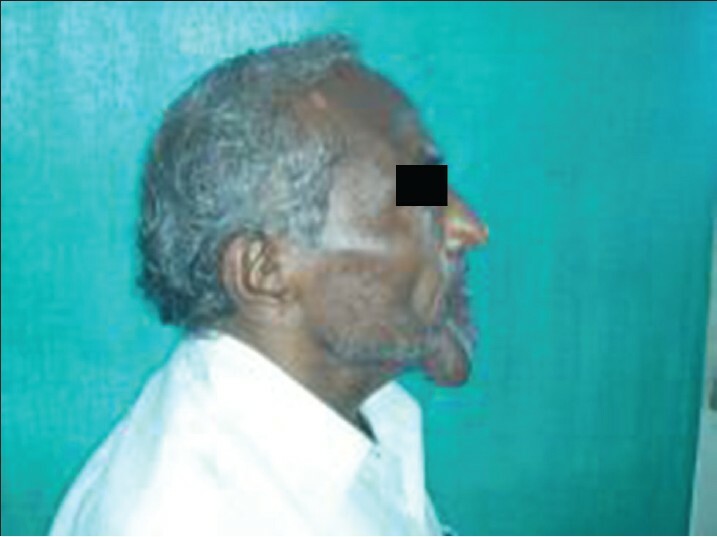 Piattelli A, Fioroni M, Rubini C. Intramuscular lipoma of the cheek: A case report. J Oral Maxillofac Surg 2000;58:817-9. 6. Lacey MS, Craig I. Infiltrating lipoma of the face. Ann Plast Surg 1995;35:307-9. 7. Pélissier A, Sawaf MH, Shabana AH. 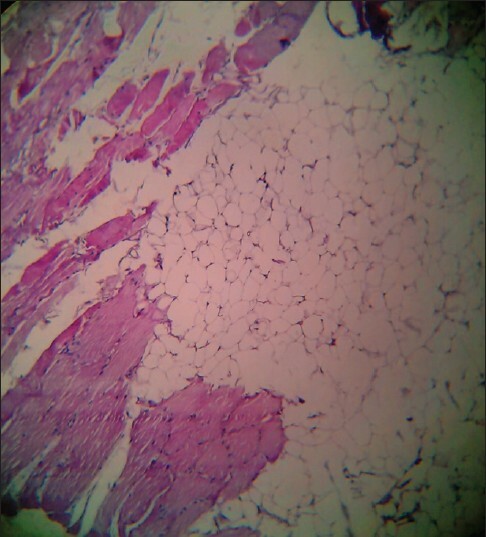 Infiltrating (intramuscular) benign lipoma of the head and neck. J Oral Maxillofac Surg 1991;49:1231-6. 8. Bennhoff DF, Wood JW. Infiltrating lipomata of the head and neck. Laryngoscope 1978;88:839-48. 9. Scherl MP, Som PM, Biller HF, Shah K. Recurrent infiltrating lipoma of the head and neck. Case report and literature review. Arch Otolaryngol Head Neck Surg 1986;112:1210-2. 10. Garavaglia J, Gnepp DR. Intramuscular (infiltrating) lipoma of the tongue. Oral Surg Oral Med Oral Pathol 1987;63:348-50. 11. Takeda Y. Intramuscular lipoma of the tongue: Report of a rare case. Ann Dent 1989;48:22-4. 12. Shirasuna K, Saka M, Watatani K, Kogo M, Matsuya T. Infiltrating lipoma of the tongue. Int J Oral Maxillofac Surg 1989;18:68-9. 13. Ayasaka N, Chino T Jr, Chino T, Antoh M, Kawakami T. Infiltrating lipoma of the mental region: Report of a case. Br J Oral Maxillofac Surg 1993;31:388-90. 14. Bataineh AB, Mansour MJ, Abalkhail A. Oral infiltrating lipomas. Br J Oral Maxillofac Surg 1996;34:520-3. 15. Epivatianos A, Markopoulos AK, Papanayotou P. Benign tumors of adipose tissue of the oral cavity: A clinicopathologic study of 13 cases. J Oral Maxillofac Surg 2000;58:1113-7. 16. Ergün SS, Kural S, Ulay M, Bilgiç B. Infiltrating lipomatosis of the face. Ann Plast Surg 2001;47:346-8.